While I am very over the ironic T-shirt as self-expression trend, I can’t help loving Glarkware. 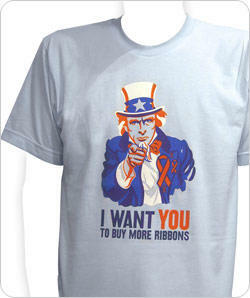 And so, despite my over-ness, I want to buy everyone I’ve ever met one of these shirts, because maybe then those awful ribbons would go away. P.S. And if I knew any babies, I’d get them a cute little “I am not a drug mule” t-shirt from Glarkware, too.